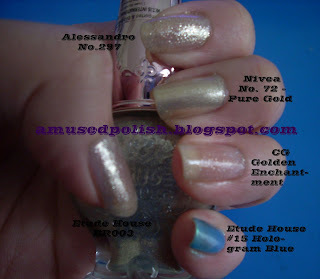 I'm going to show you some old swatches since I'm a bit lazy. 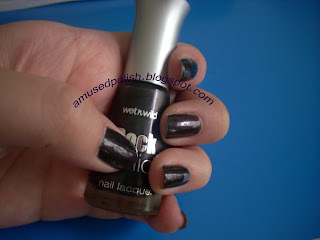 The pics show Opi Ink Suede and it has got nothing to do with their original names. 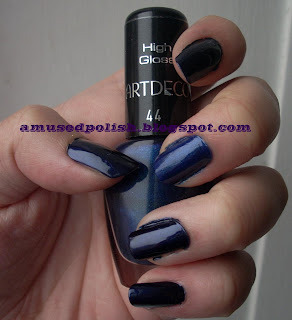 I bought this one because I've seen some swatches of these with an topcoat and 'cause I'm not a bit matte-polish fan. 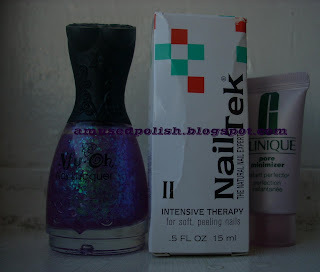 I also have the original (Opi Ink) and and forgot to make an comparison swatch but I think those of you who own it know how hard Opi Ink is to capture it's full awesomeness (and I definitly need to get an back-up bottle of it). Oh well, enough about Opi ink- now about the Suede version of it: the application (like all opi's) was great, I love the Opi brushes. It was opaque with two coats and dried super fast. 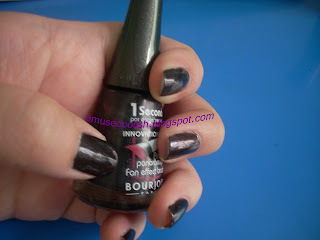 Once painted on your nails- about half a minute and it is dry. 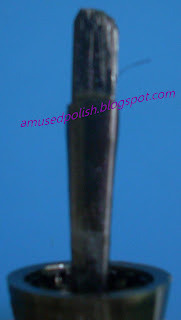 Now the not so great part about them: unfortunatly the Suedes( or matte polishes in general?!) chip really fast. Well it is written on the little lable with the elastic wraped around the handle so I don't blame Opi for not telling their customers. I'm so happy right now. I'm feeling like a little girl who is so happy and squirelly (can't find an good translation for the german word "hibbelig"). 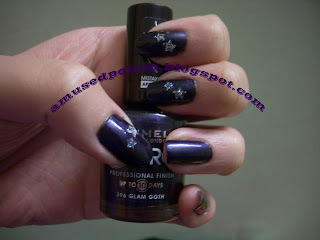 I was part of the Christmas Polish Blogger exchange on elfster (organized by the wonderful Nicole from Magic Maid ) Yesterday I got my package from my secret Santa, Velvet from "Bring on the Bling" (check out her great blog :) ). All the polishes she got me were on my wishlist. I can't believe it that she got them all. f.l.t.r. 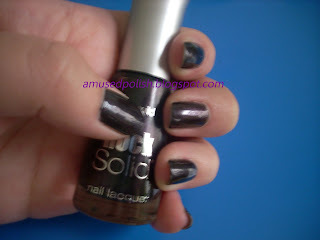 : Color Club Worth the Risque, Wet'n'Wild Wild Orchid(like all purples, hard to make a pic of it), Hard candy Lava & *drumroll please* Diamond Cosmetics - Chainmail Charm. yes, Chainmail Charm- a (?possible?) 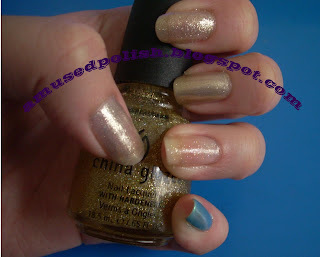 dupe for Opi's (old version of) My Private Jet, which I've been longing for since I first saw some swatches months ago. 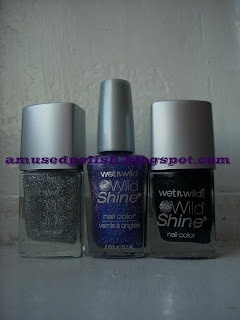 W'n'W - Wild Orchid: They do sell W'n'W here but only a limited choice of colour/polishes so I was thrilled when I unwrapped it from the bubble-wrap. More later in this post. 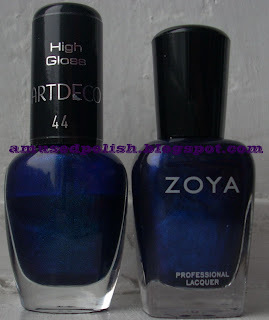 Hard Candy polishes: The blogs that I'm always reading are mostly from the US and also another lemming of mine. 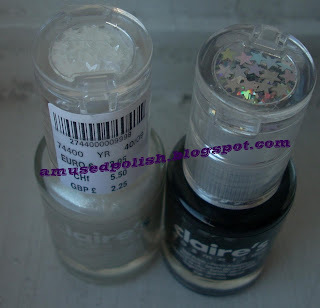 Plus the ring on each bottle makes them quite unique 'cause I can't think of a brand that includes a ring in every polish bottle they sell. 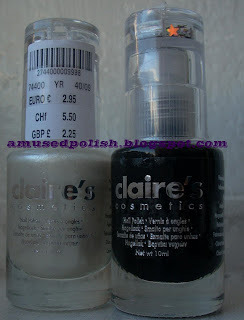 As you can see there's a slight difference of the European& American version- both the bottle shape& how much polish is in each. The European one has only 10ml and the American has got 12,7ml. I have to admit that I like the American Verion of it better- the bottle shape is more "one of a kind" and not a "standard size". Plus you'll get more in the American bottle. 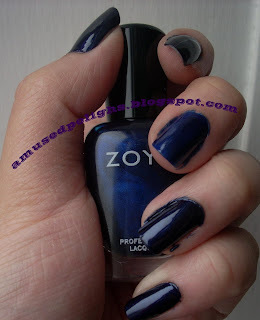 Today's post is about another Frankenpolish I made. It's called Write with it! and the colour itseld reminds be of Ink. The pictures are a bit lighter than the colour actually is and I honestly don't remember what I put in there. 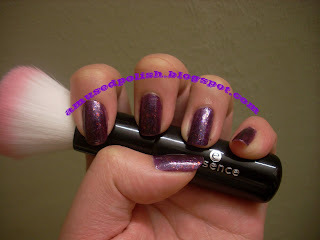 I'm pretty sure I took Essence Show your feet polish in 02 Deep Blue Sea and b.pretty in Silver stars- I don't know what the rest of the polishes are/were. The actual colour is a really dark blurple- but more a blue than a purple. It was opaque in 2 coats. There was also no sunlight when I took the pictures so I'm going to show you some with flash and some without. up: I think this picture would do the colour itself justice. Just a quick post that the wonderful Amarena is having a giveaway to celebrate her 100 followers. 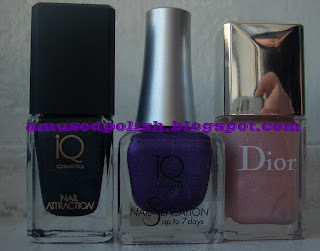 she's giving away a few S-he nail polishes and a few other polish-related things. Giveaway at "Hamburg aus der Sicht einer Beautysüchtigen"
A fellow german Blogger, Nicole from " Hamburg aus der Sicht einer Beautysüchtigen" is having an giveaway. She's celebrating her 6th month Blog-anniversary. Nicole's giving away the "Celebulante Set" of/by( don't know which one) Benefit. Today's (again?) an old mani I did for my birthday. I know, I'm a bit late for posting this one but it's quite a slow NOTD week so I post some back-ups I've got in my folder. I used two coats(I think) of China Glaze's Ruby Pumps, Konad's Image Plate M73 and Konad's special Princess Polish in Black Pearl( I think that's the name of it). The day I took the pictures was quite cold and the window got somehow steamy. There's a giveaway at Manicure Mommas. 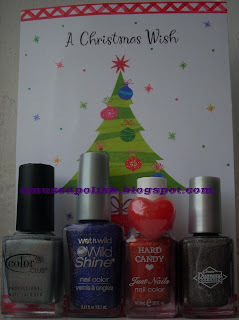 They're giving away the Ultra Exclusives of the Opi Christmas Collection in three mini-bottles. Click here for more details to win.